One of the pleasures of spring restoration work is weeding garlic mustard from the edges of the prairie. When you’re on your knees in the dirt, a universe opens up that you might otherwise miss. 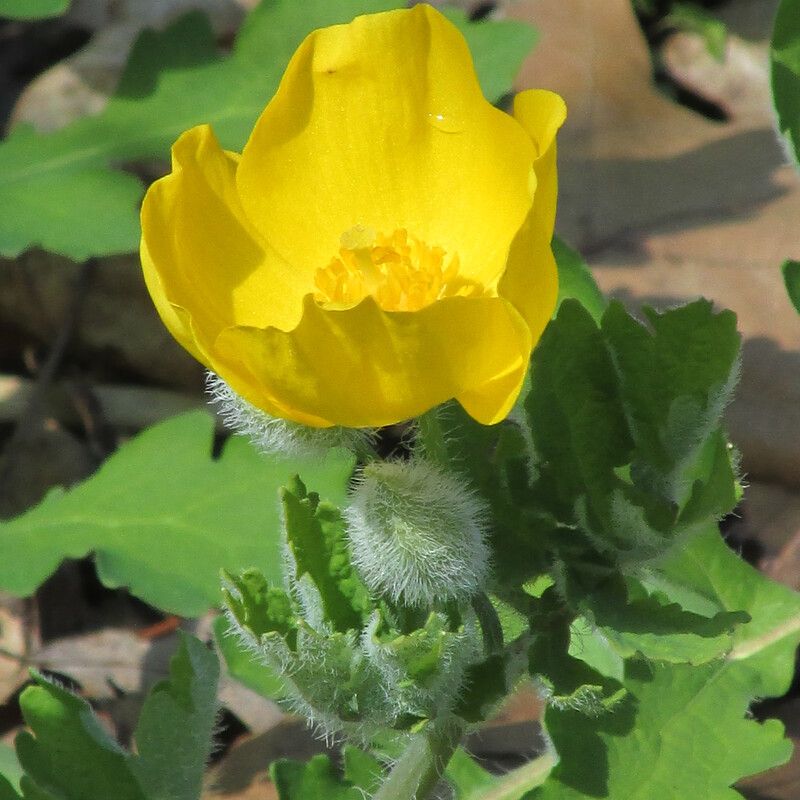 Like these celandine poppies with their furry buds opening. What other surprises, you wonder, are out there to be discovered? All spring, my volunteer team and I weed garlic mustard in transition zones around the prairie proper. 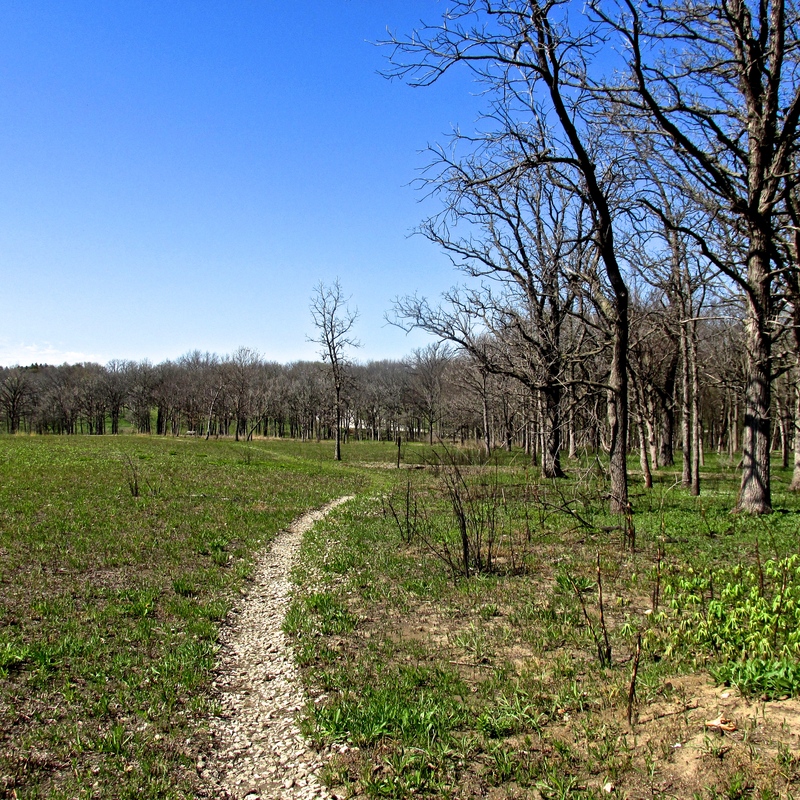 These areas are full of a wild mix of woodland, prairie, and oak savanna species. 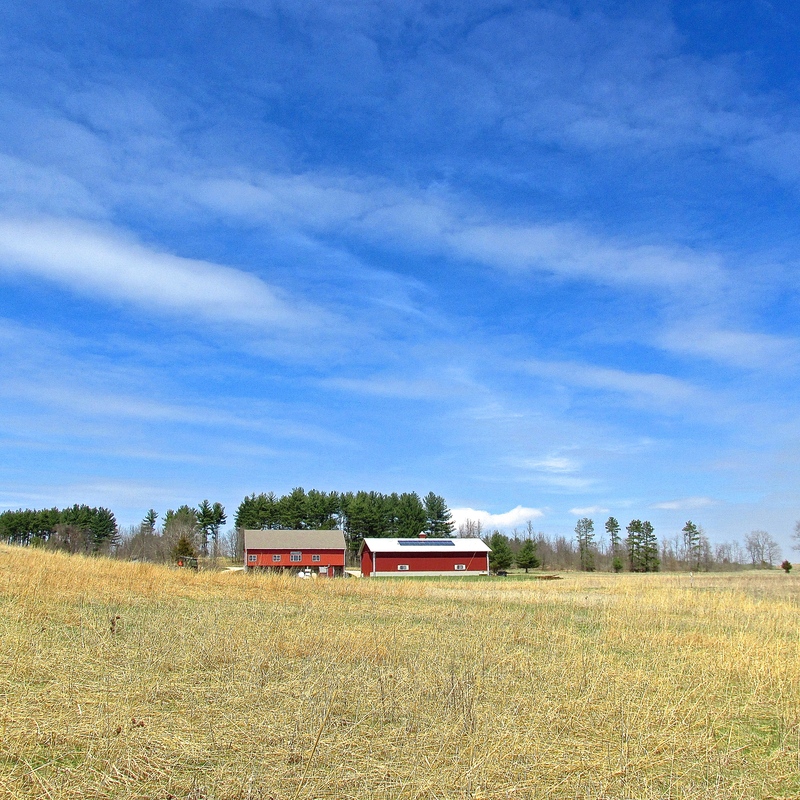 There are also surprises, such as escaped garden flowers —- tulips, daffodils, and scilla —left from when people lived on the edge of the former farm, where the Schulenberg Prairie is today. Garlic mustard is our arch-enemy. Tenacious. Invasive. We dig it out. Although it’s edible in small amounts, no one gets too excited about that, maybe because I once mentioned that garlic mustard contains tiny amounts of cyanide. It took the edge off of everyone’s appetites. 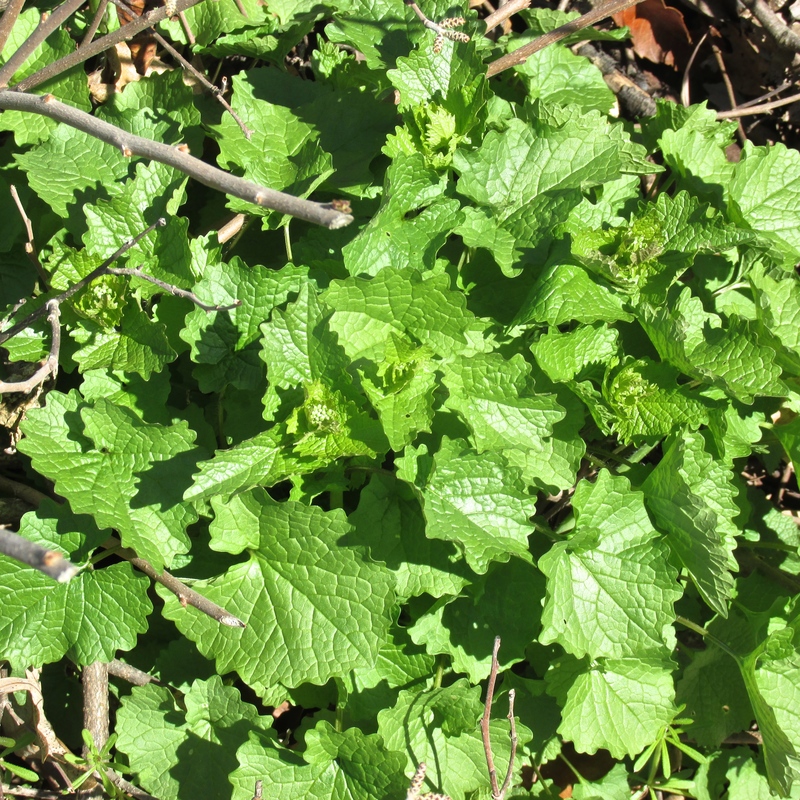 Removing garlic mustard makes room for the native wildflowers to grow; prairie, savanna, and woodland become healthier. 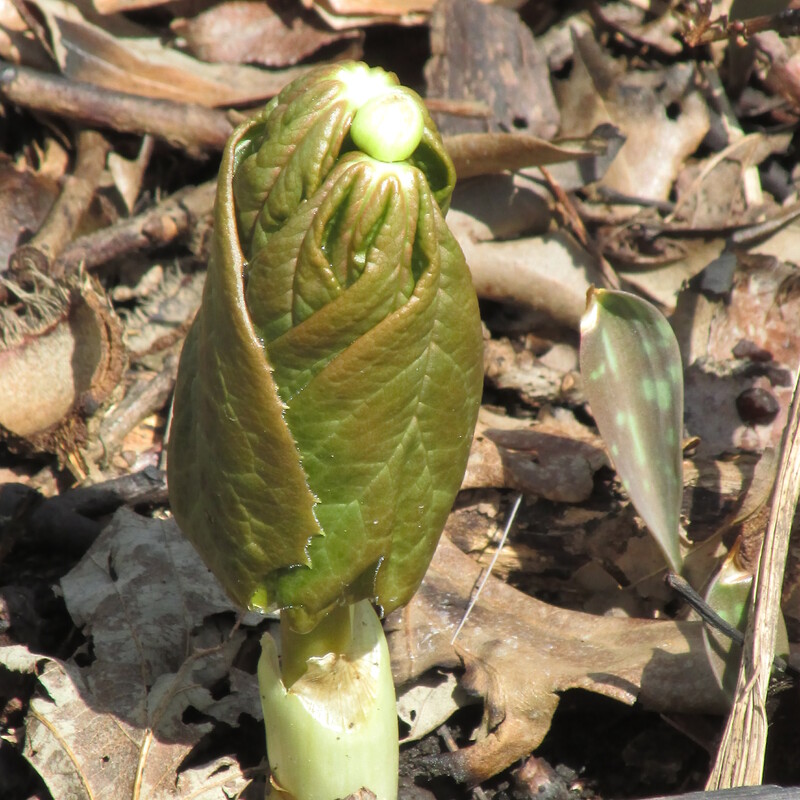 Right now, on the edges of the Schulenberg Prairie, we’re seeing a lot of traditional woodland bloomers. 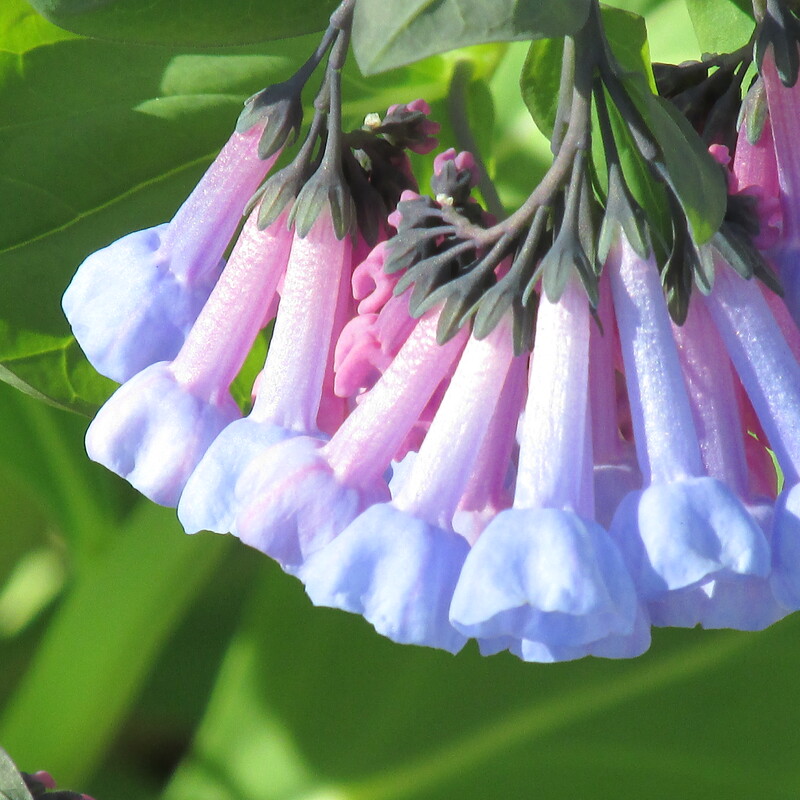 Virginia bluebells play their music in light shade. 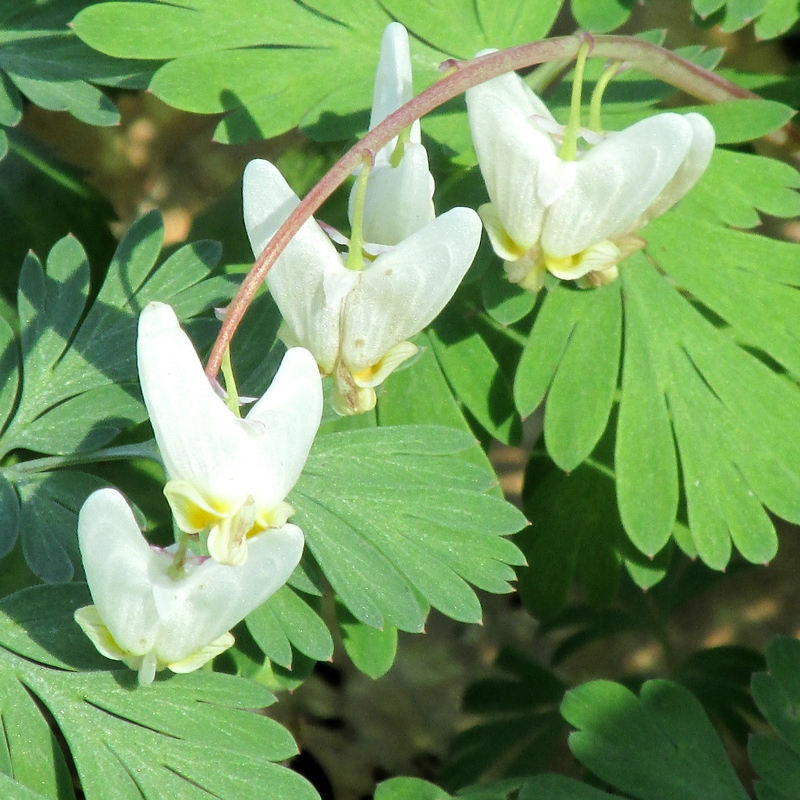 Dutchman’s breeches hang their pantaloons out to air by Willoway Brook. Wood anemones send up their solitary blooms. 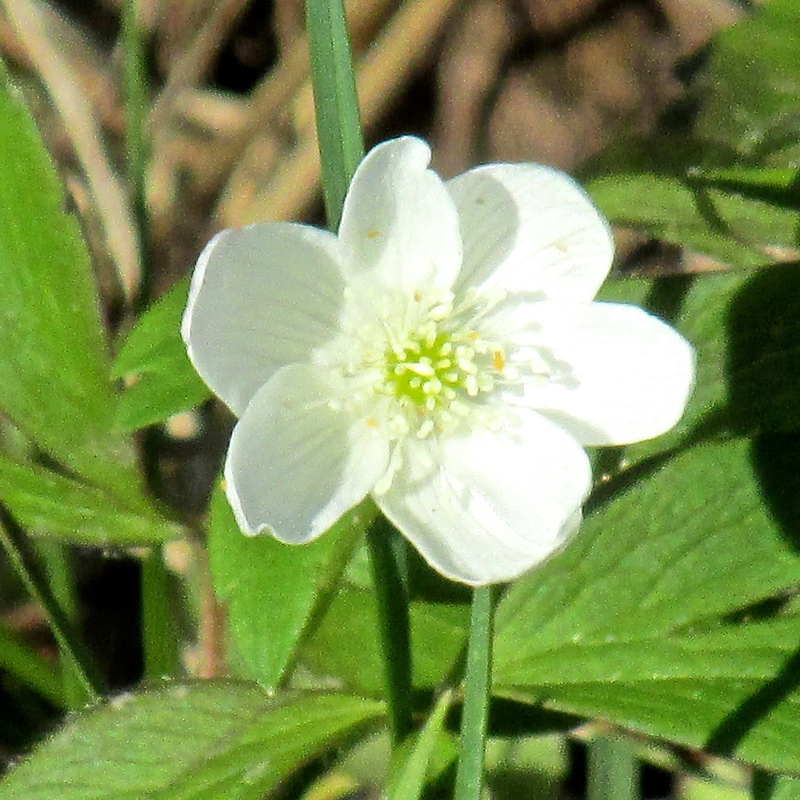 In the Victorian Language of Flowers, to give someone a wood anemone was to tell them you felt “forsaken.” The single white flowers do look a bit lonely, don’t they? 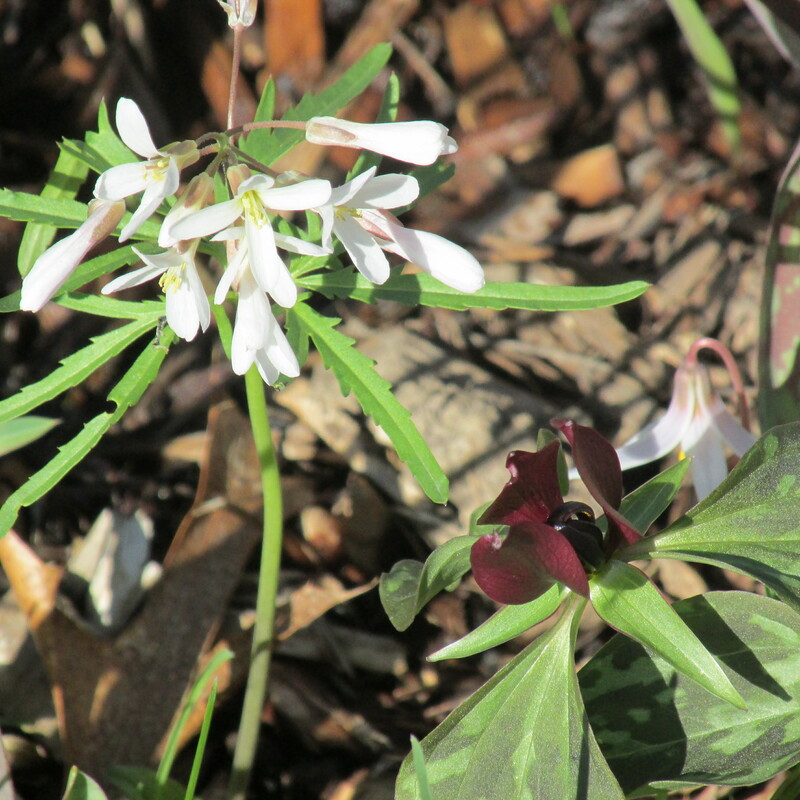 Cut-leaved toothwort (left) and prairie trillium (right) are two friendly companions of the light woods. Toothwort has namesake toothy nodules on its rhizomes, and was purported to be good for toothache because of this resemblance. The deep burgundy prairie trillium is sometimes known as “trinity flower,” with its trio of dappled leaves. 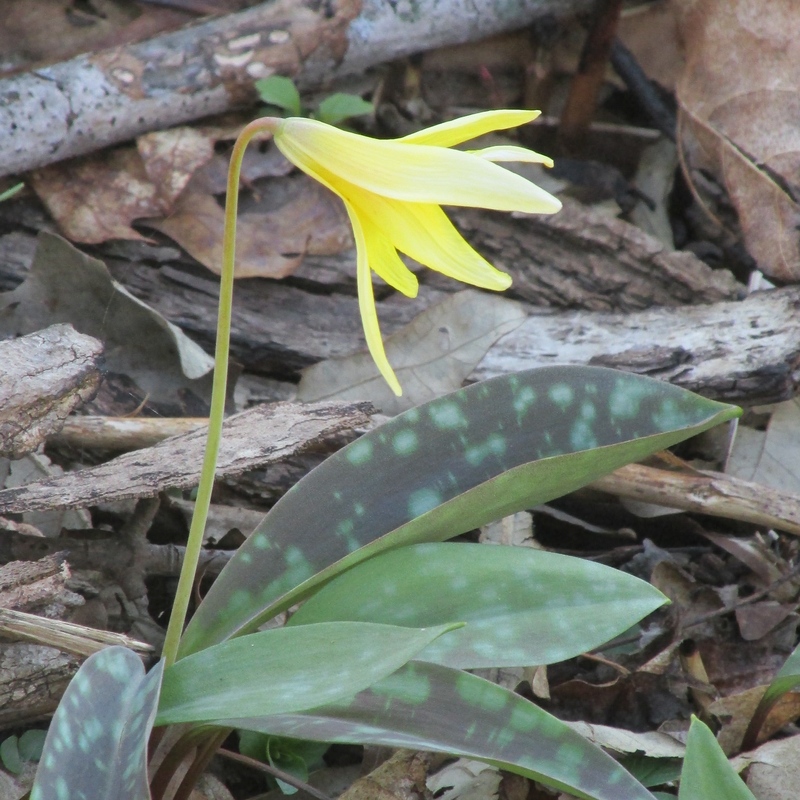 I love the trout lilies: both the white and the yellow. The yellow ones are smooth as butter; bright as sunshine. 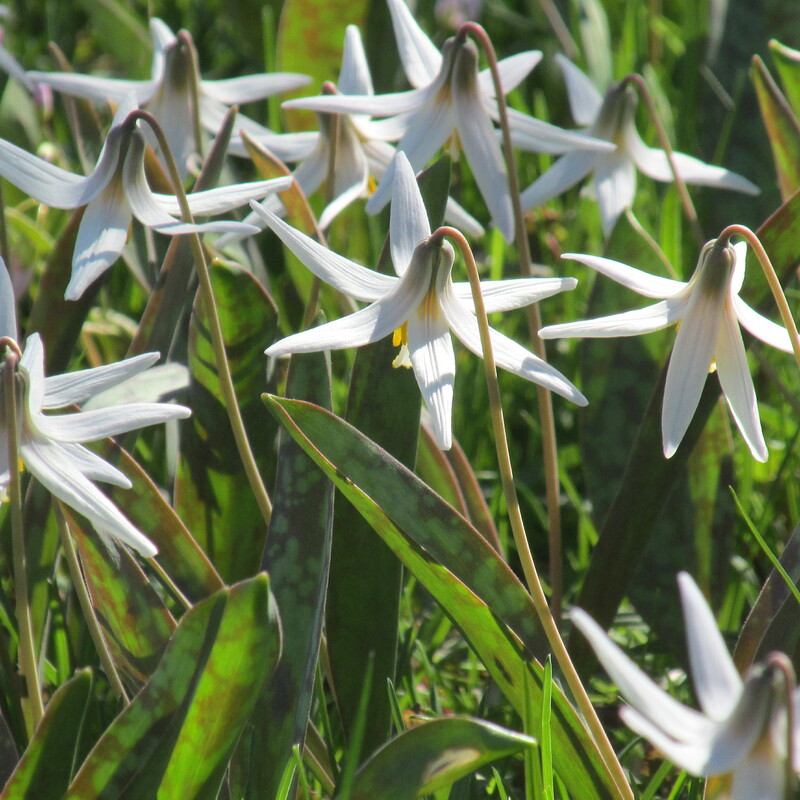 While the yellow ones are a bit difficult to find, the white trout lilies mass everywhere by the prairie — vast colonies, thousands of them, like a grassy Milky Way Galaxy. A universe of beautiful surprises. 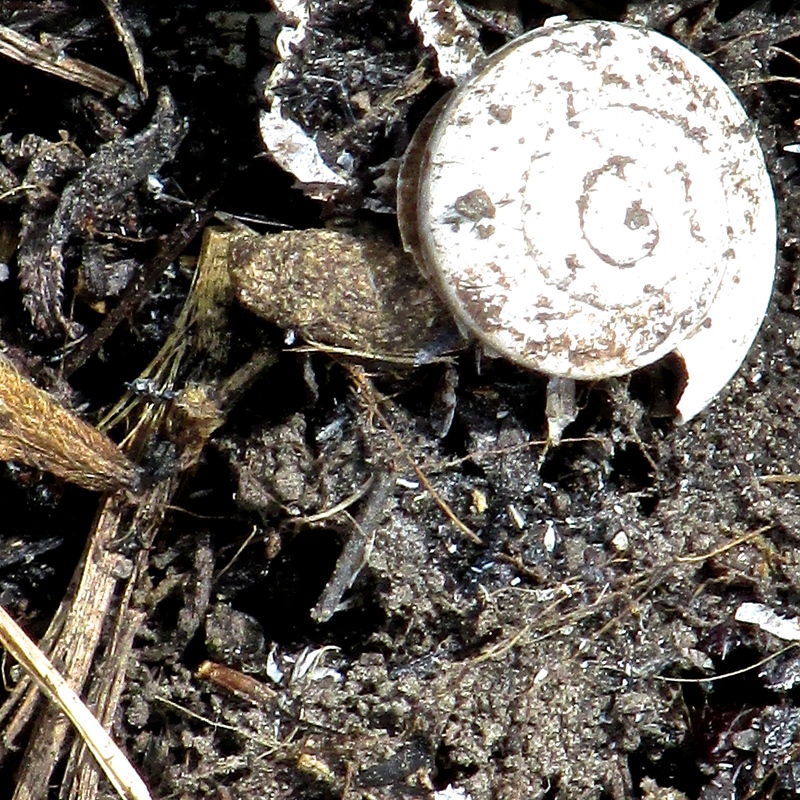 All this and more, waiting to be discovered… while on our knees, weeding garlic mustard. (All photos by Cindy Crosby from the Schulenberg Prairie edges at The Morton Arboretum in Lisle, IL. Top to bottom: Trail bordering the prairie and prairie oak savanna; celandine poppy (Stylophorum diphyllum); garlic mustard (Alliaria petiolata) ; Virginia bluebells (Mertensia virginica); Dutchman’s breeches (Dicentra cucullaria) ; wood anemone (Anemone quinquefolia); cut-leaved toothwort (Dentaria laciniata) and prairie trillium (Trillium recurvetum); yellow trout lily (Erythronium americanum); white trout lilies (Erythronium albidum). 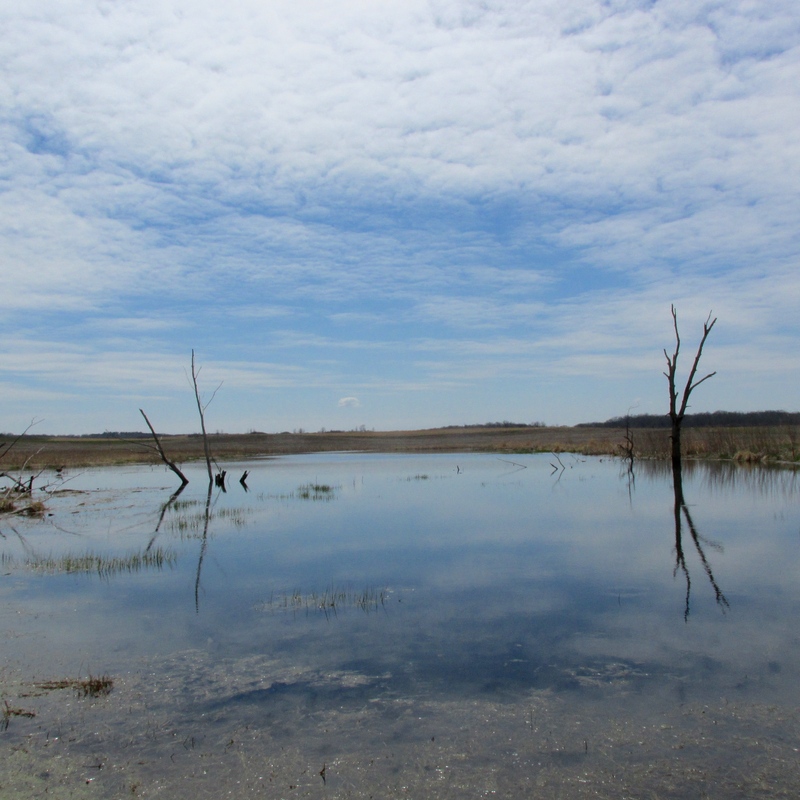 I went for a hike a few days ago at Nachusa Grasslands, 90 miles west of Chicago, where I volunteer as a dragonfly monitor. Nachusa has been in the news in Illinois quite a bit over the past several months. 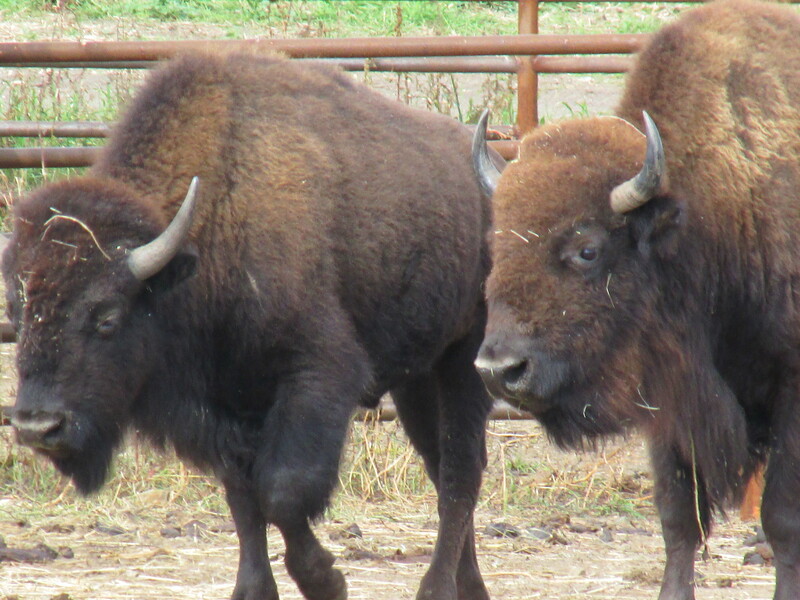 The spotlight on this amazing 3,200-acres-plus mosaic of prairie, wetlands and woodlands revolves around Nachusa’s successful bison introduction last fall. 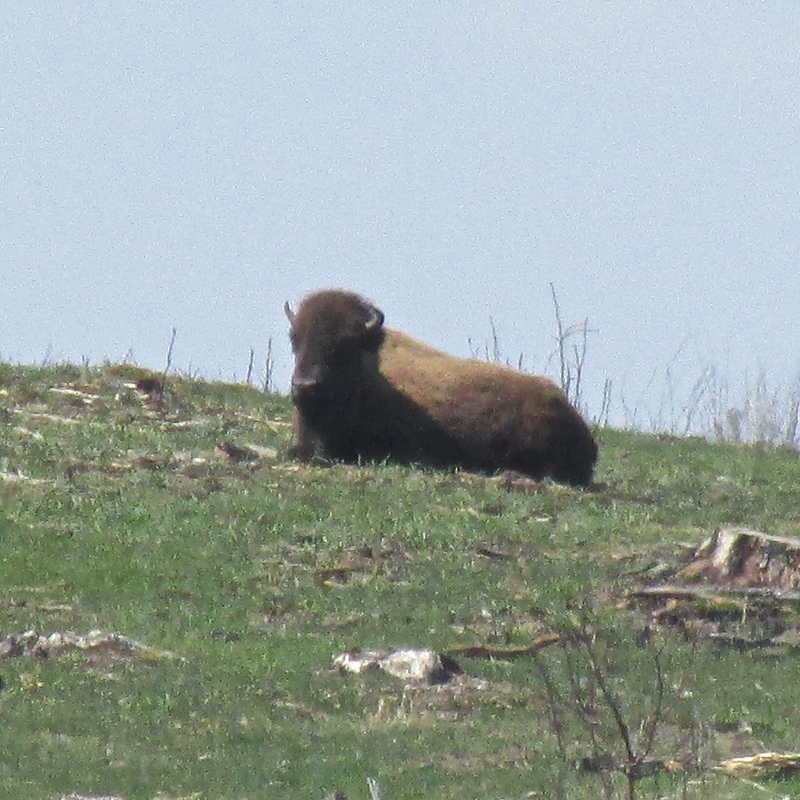 The first baby bison birth announcements have hit the front pages of the newspapers. There’s a lot of excitement over these charismatic megafauna and their cute offspring, and deservedly so. But, it’s easy to forget some of the more humble inhabitants — more than 700 species — who live at this beautiful place. One of these inhabitants – and one of the first prairie wildflowers to bloom at Nachusa — is one of the most fleeting and difficult to see. 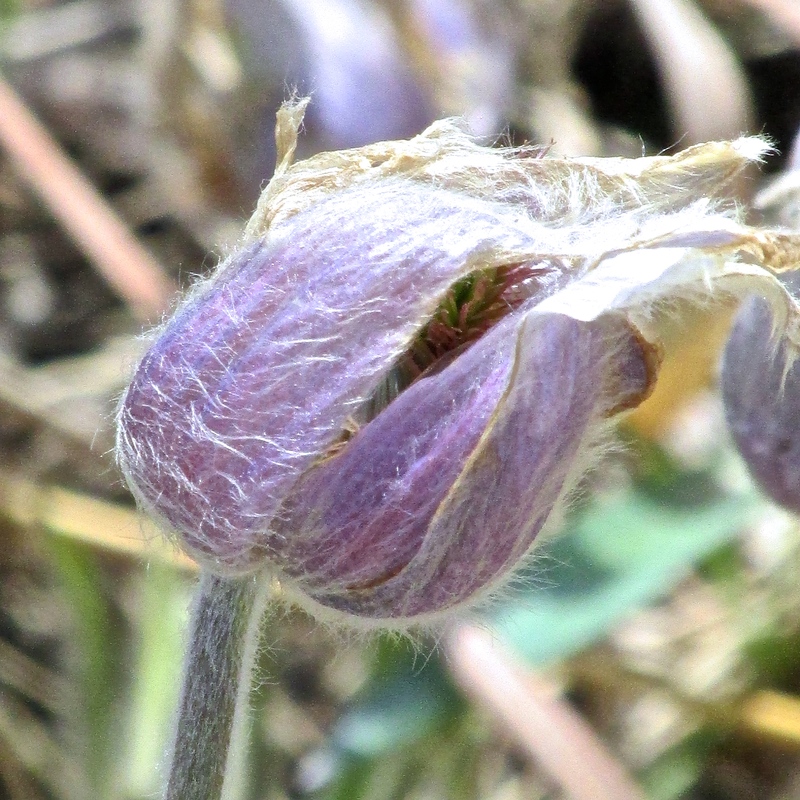 Also known as the Easter flower, wild crocus, prairie crocus, or windflower, pasque flowers (Anemone patens) bloom for a week or two in early spring. The pale lavender blooms are almost invisible against last year’s prairie grasses. Then, before you can blink, they’re gone. 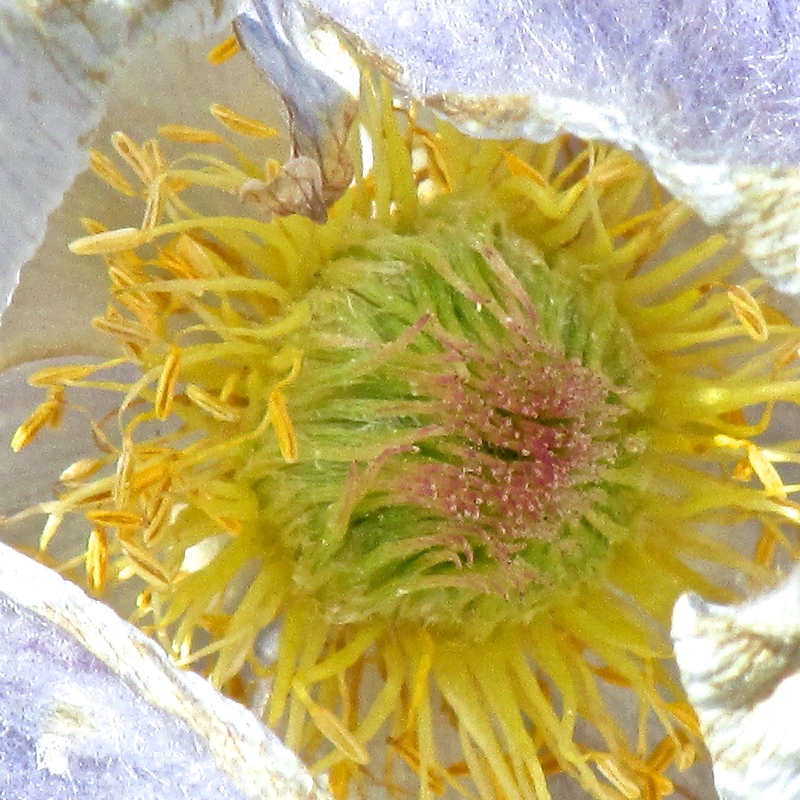 We’re at the southeasterly boundary of the hairy pasque flower’s range in upper Illinois. Looks furry, doesn’t it? 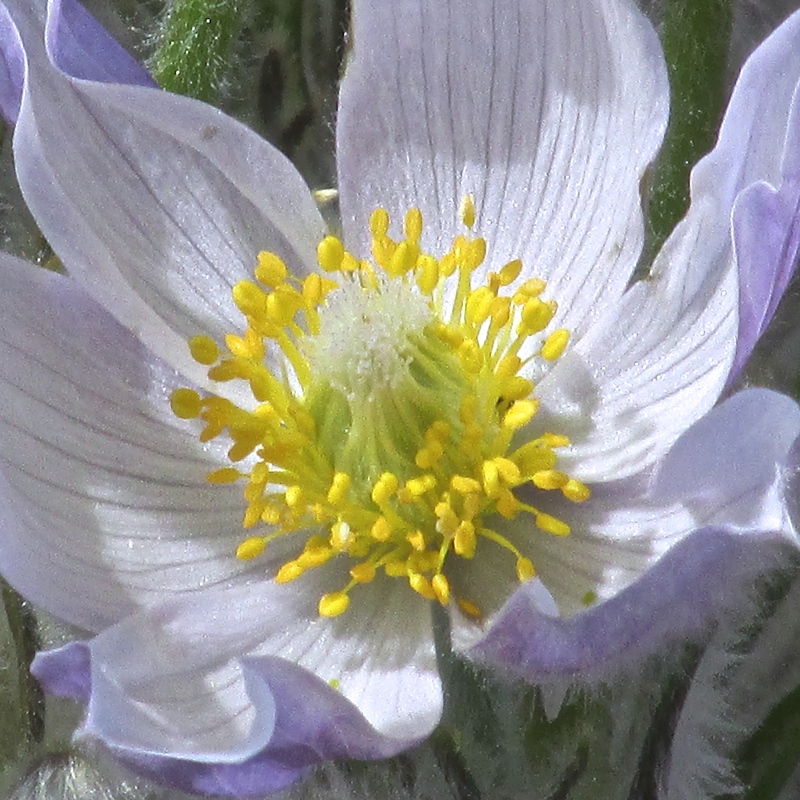 Native Americans said the Great Spirit gave the pasque flowers those hairs to serve as a warm furry robe, in gratitude for helping a young man. 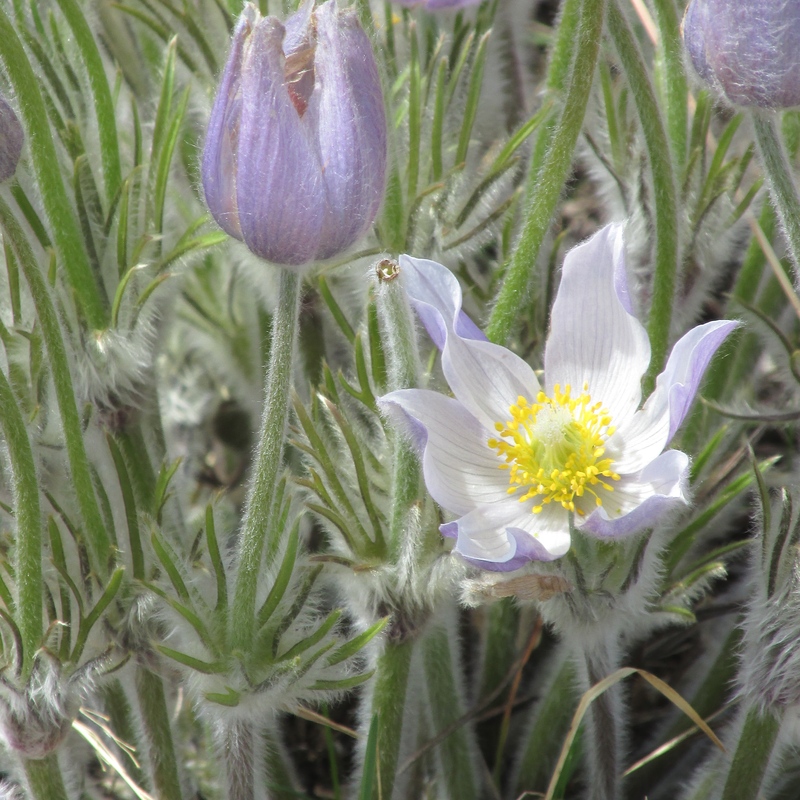 Runkle and Roosa also tell us when the Dakota Indians spotted the first pasque flower, they sang a special song. Singing was believed to encourage the rest of the prairie to bloom. 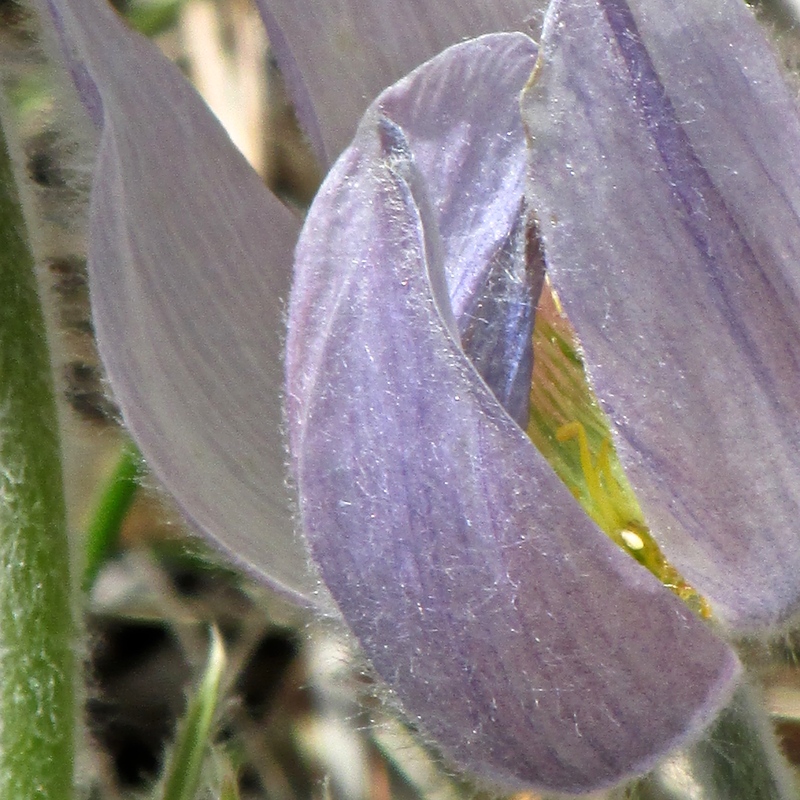 After a long cold winter, perhaps this pasque flower tradition — singing the prairie to life — is the best medicine of all. Thanks to Thomas Dean for introducing me to the poem, The Flower-Fed Buffaloes by Vachel Lindsay, excerpted above. The complete poem is available online at The Poetry Foundation: http://www.poetryfoundation.org/poem/242582. 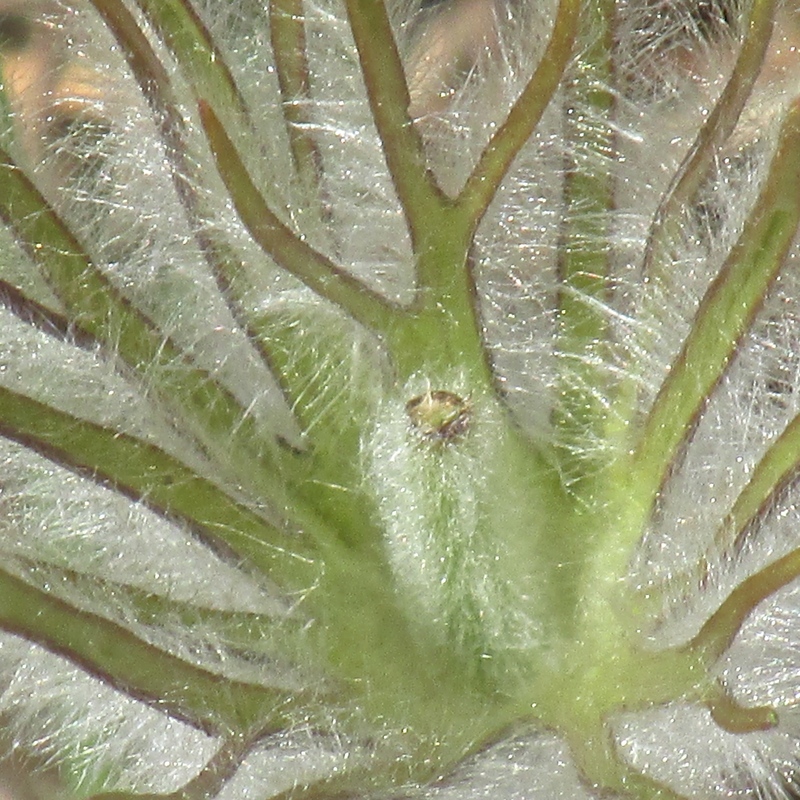 The Native American story of the hairs of the pasque flower is found at http://galileo.org/kainai/pasque-flower/. 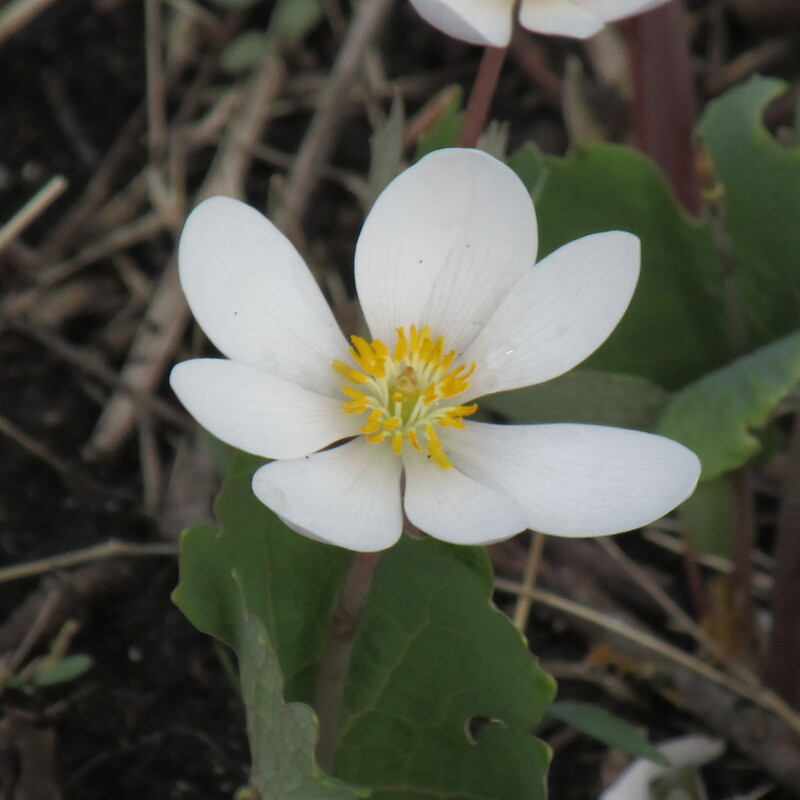 All photos above by Cindy Crosby, taken at Nachusa Grasslands, Franklin Grove, IL: Nachusa headquarters; two photos of bison; Prairie Pot Holes Unit; and six different photos of pasque flowers in various stages of bloom and post-bloom. Two weeks ago the prairie was a smoldering ruin. Now, it brims with possibility. 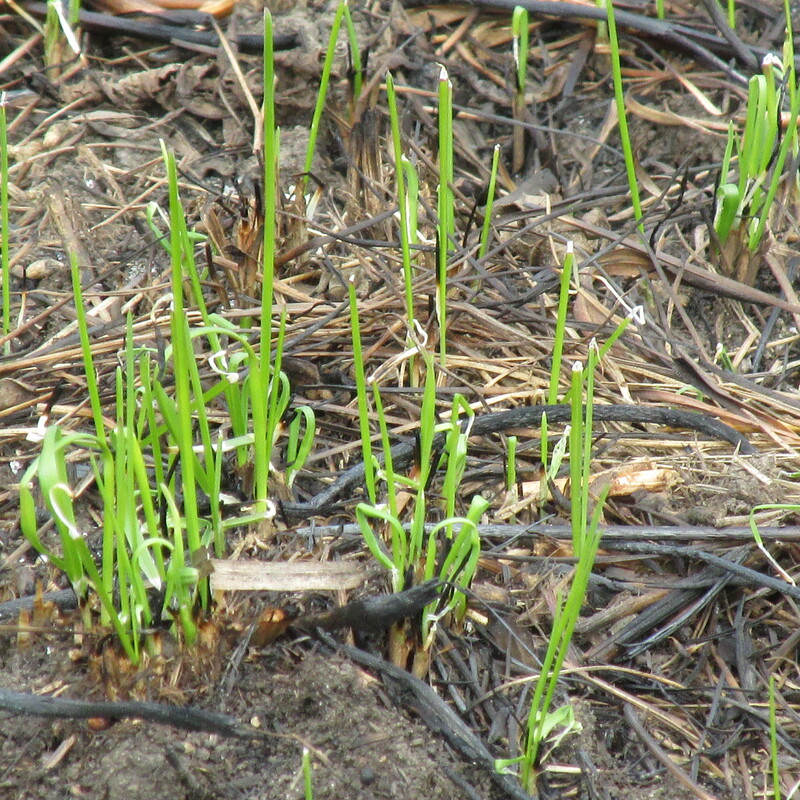 There’s a surge of energy as green shoots push against ash and earth to break through to sunshine. 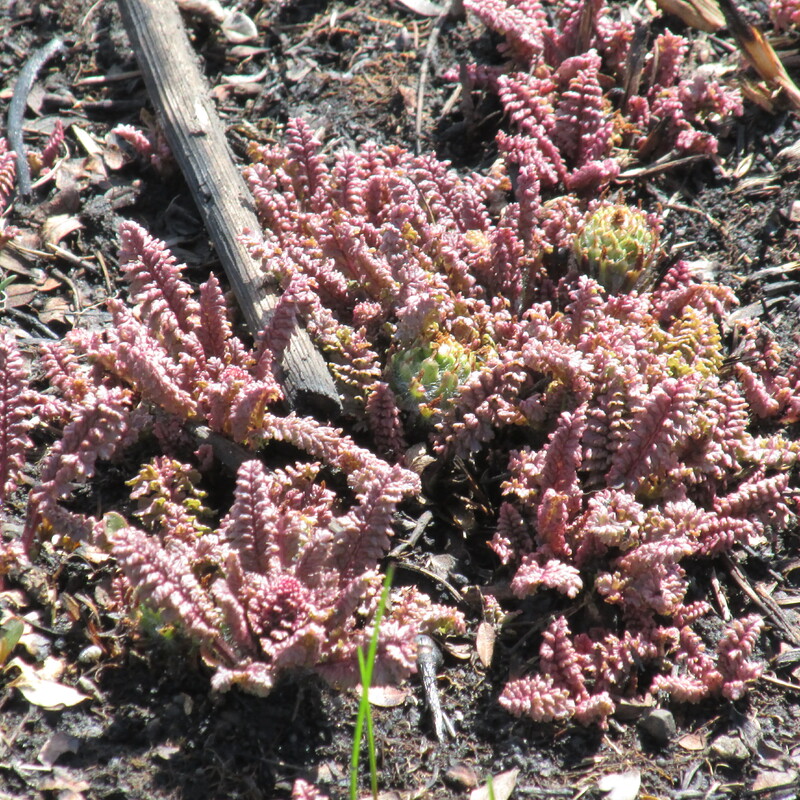 Wood betony is immediately recognizable. Ditto for the rattlesnake master, whose yucca-like leaves are ID-friendly from the tiniest sprouts. The scientific species name, yuccifolium, speaks volumes about how the leaves appear. Yucca! Of course. Despite all the new growth, the prairie is at least a week behind last season’s flowering schedule. Not a bloom in sight. However, there’s plenty of floral action in the adjacent edges of the prairie savanna. 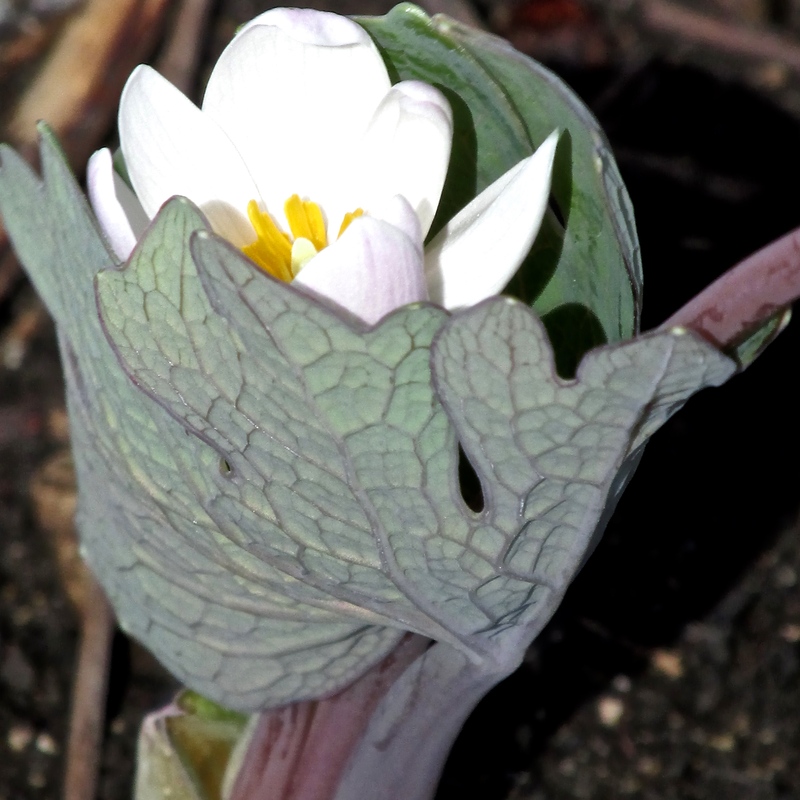 Bloodroot is opening under the trees. An evocative name, isn’t it? Earned because of the reddish sap that flows when you break the root. 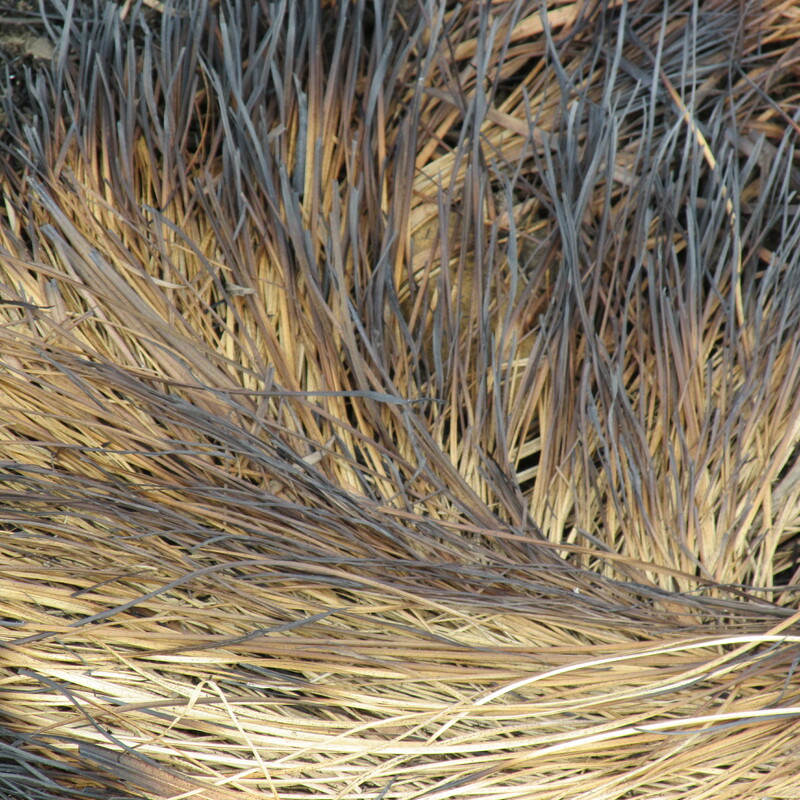 Artists use the sap to create a natural red, pink, or orange dye for baskets and textiles. Bluebells are budding. 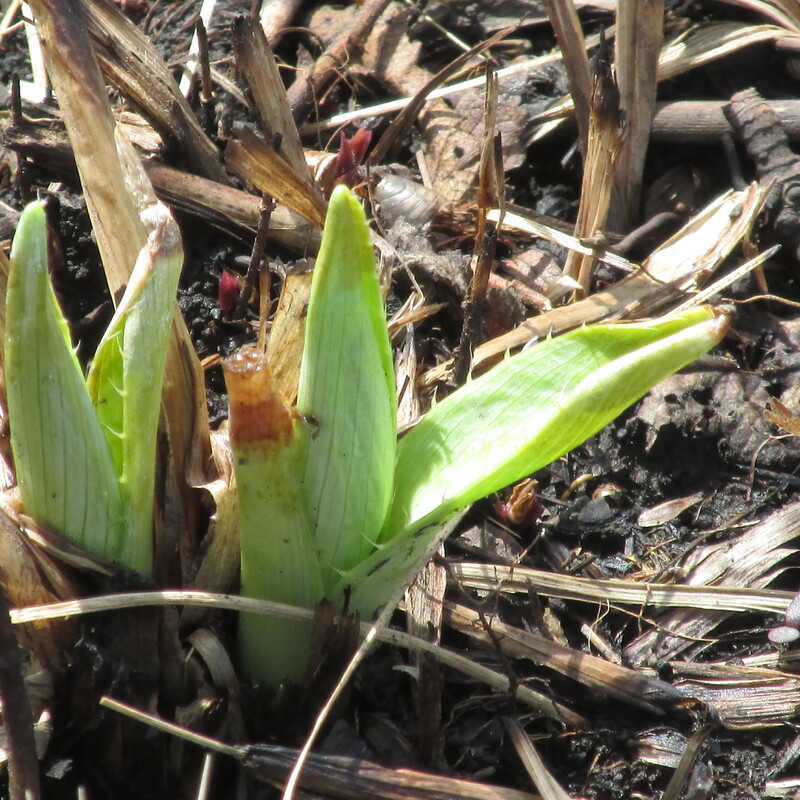 Wild ginger leaves emerge. 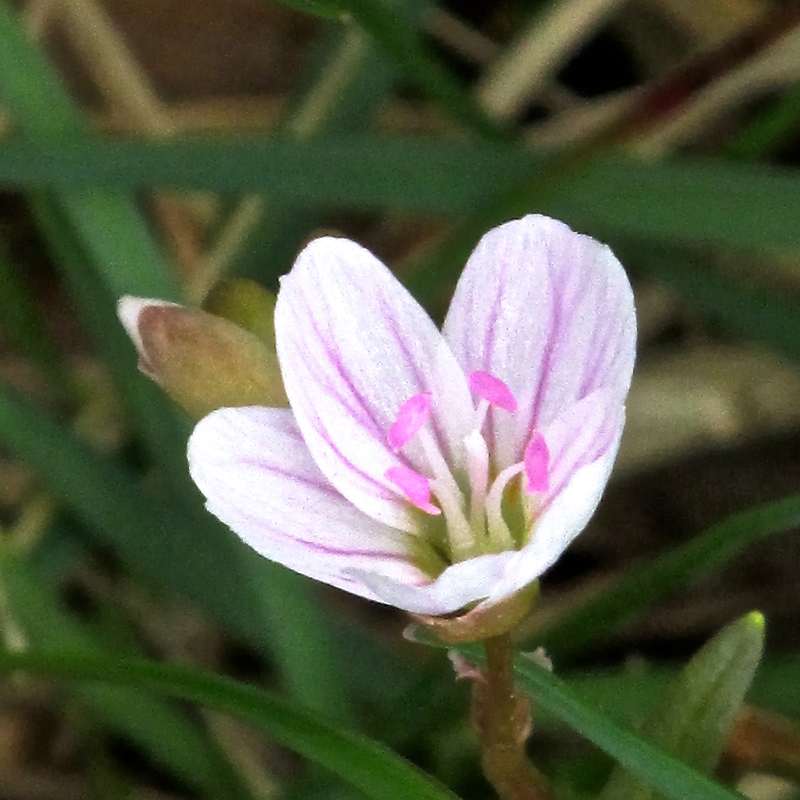 Striped spring beauties splash the grass with pink, making a starry carpet under the oaks. Spring beauties are sometimes called “fairy spuds” as foragers treat the small roots of some species like miniature potatoes. I think they’re too pretty to eat. The umbrellas of mayapples gradually unfurl. Everywhere you look is the promise of something exciting. It’s the start of a new prairie year. And you begin to believe that anything is possible. 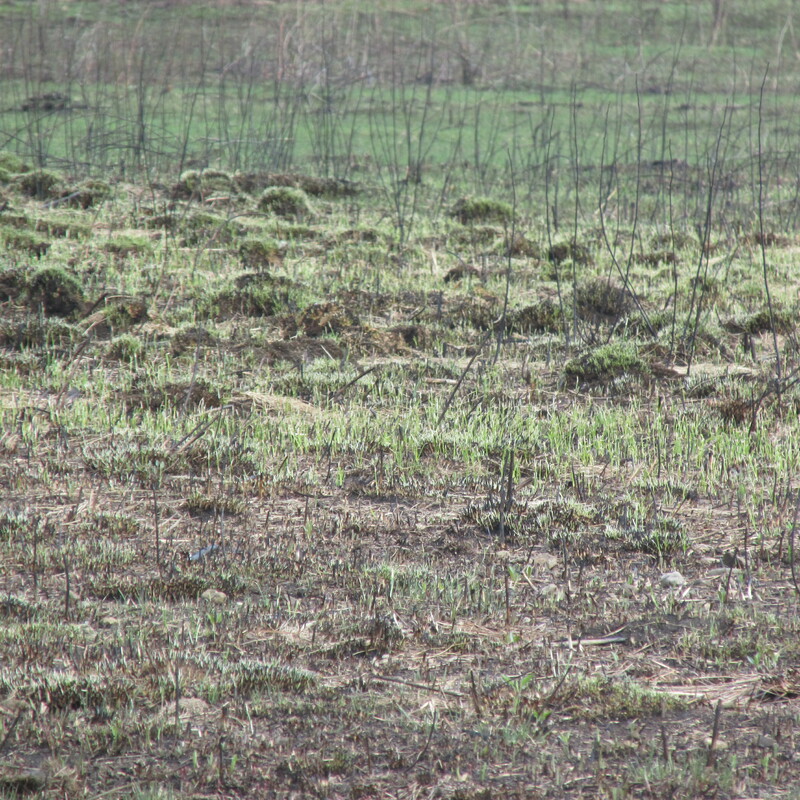 The Schulenberg Prairie is blackened after a prescribed burn that torched the tallgrass a few days ago. The landscape lies in ruins. Or so it seems. 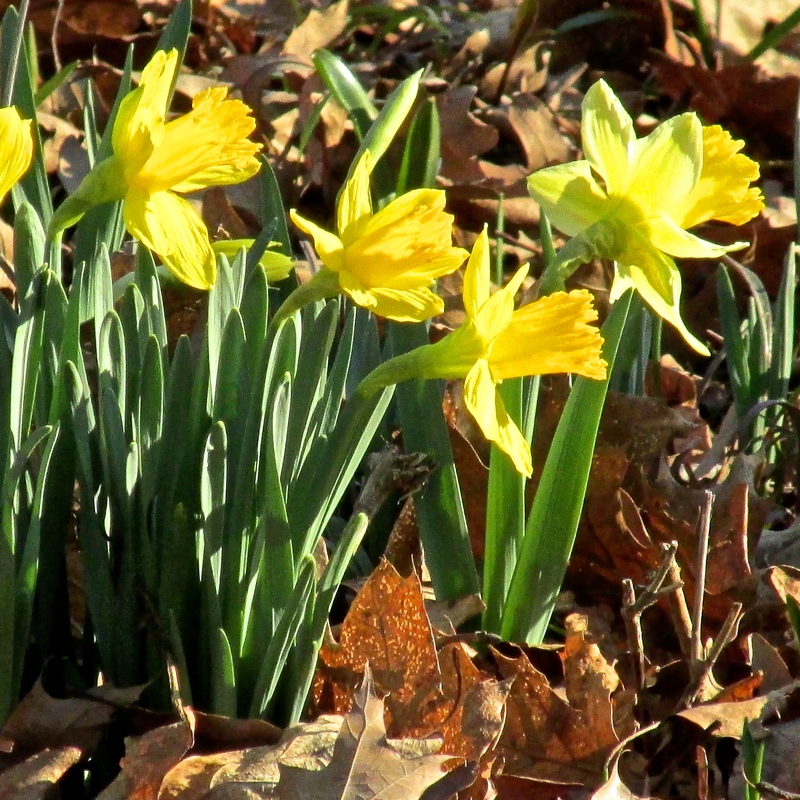 In other areas of The Morton Arboretum, hundreds of thousands of daffodils are beginning to bloom. It’s no surprise that this is where visitors focus their attention and their cameras. A burned landscape holds little attraction. After the flames pass over the tallgrass prairie, it’s difficult to believe anything will ever grow there again. And yet. 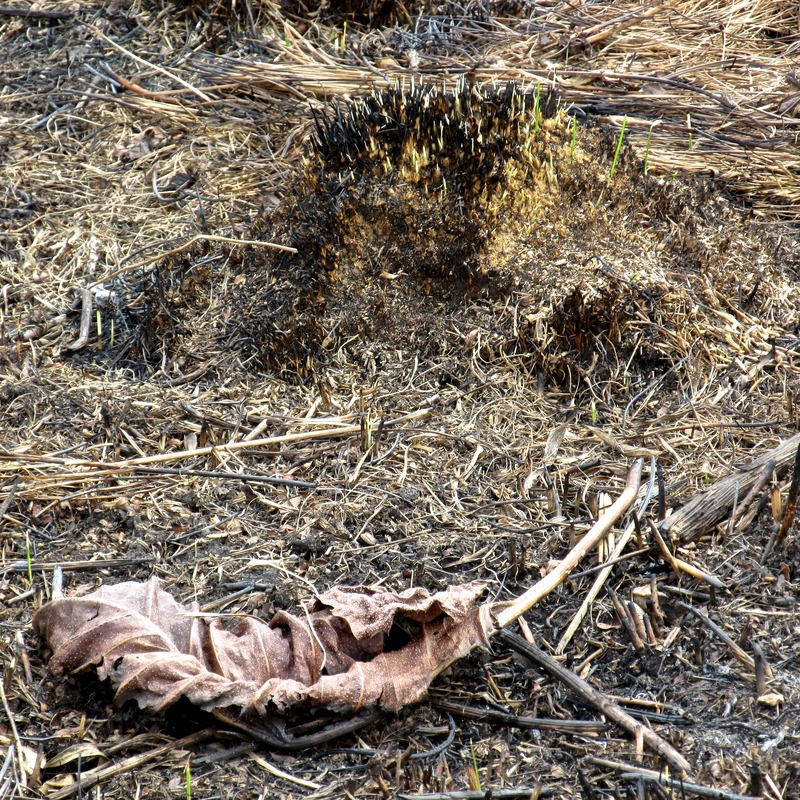 My hiking boots crunch into the charred surface of the prairie, as I look for signs of life. 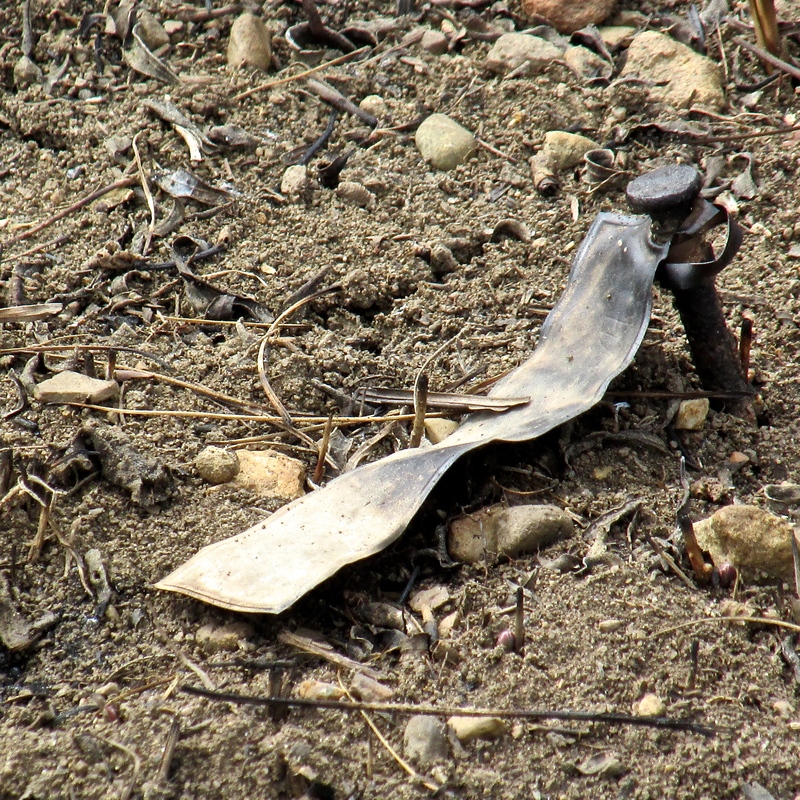 Instead, I find interesting objects revealed by the flames that have erased the tallgrass. 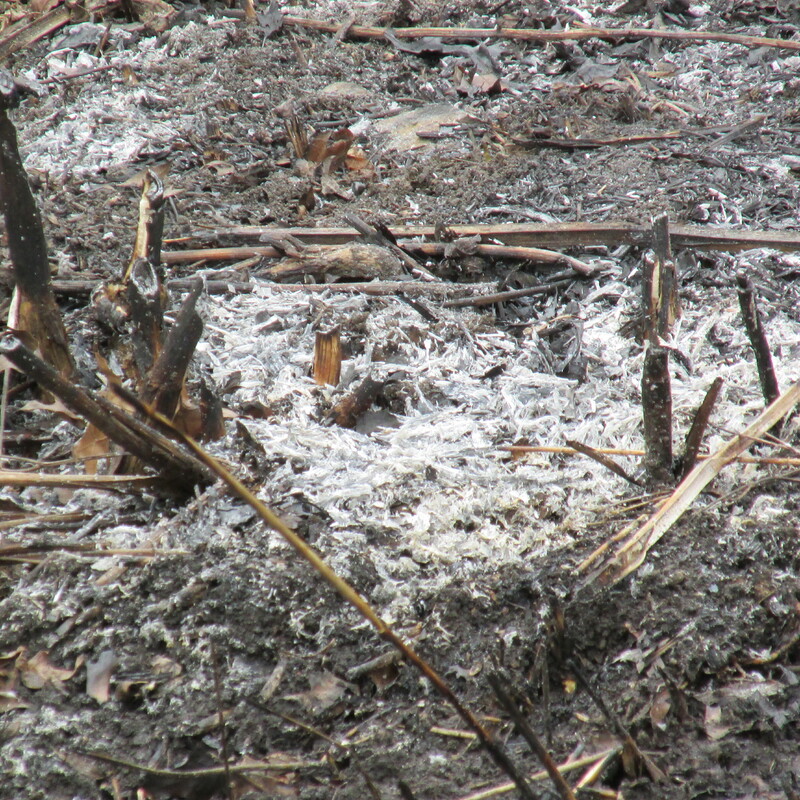 There are bones from a tiny mammal that didn’t scamper quite fast enough when the fire moved across the grasses. Snail shells. Metal tags marking some research experiment, now defunct. Prairie dropseed hummocks, shorn of all green, look like a squadron of UFO’s that touched down on the landscape. It’s no wonder the early pioneers called dropseed “ankle breaker,” and took care not to trip over the mounds hidden in the tallgrass. 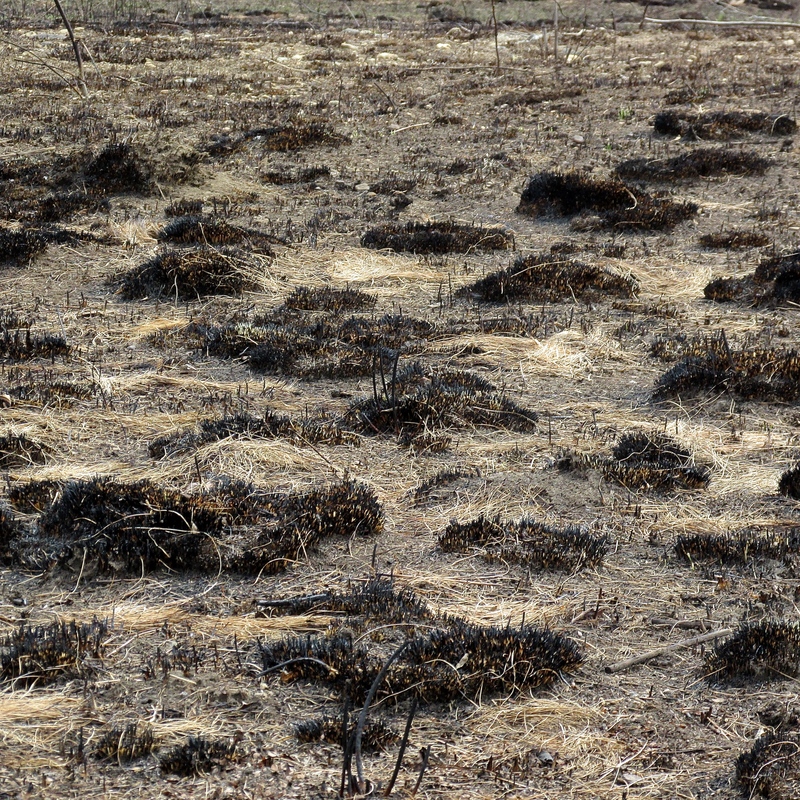 Anthills are suddenly everywhere, like fantastic dirt castles spun out of soil. 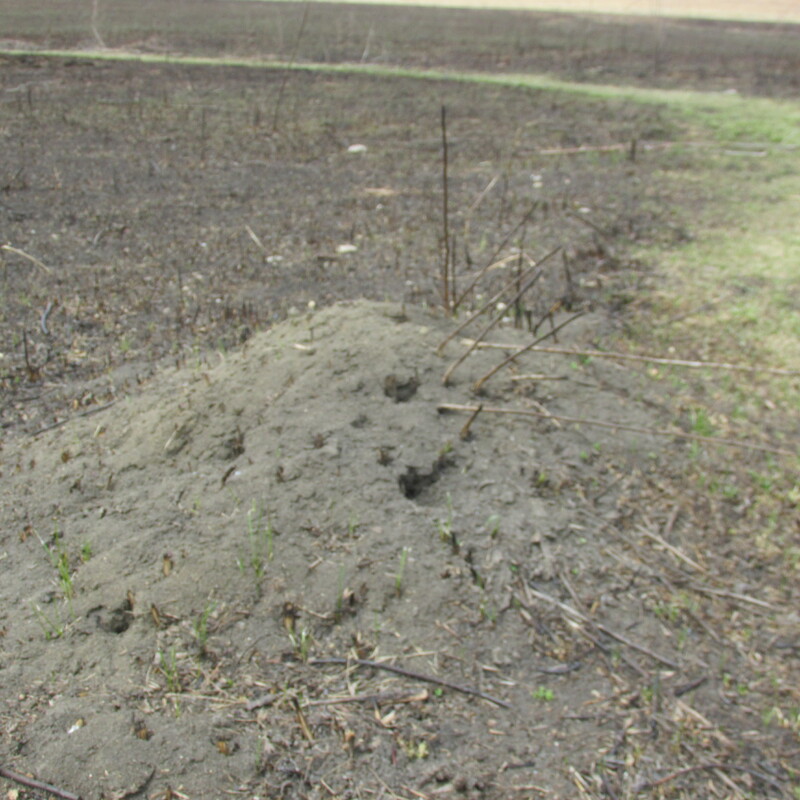 Some scientists believe these anthills and other disturbances that change the topography increase the number of different species of plants found on the prairie. Without disturbance, the life of the prairie might be less rich. I inhale the smell of soot and smoke; brush ashes from my jeans. The old prairie I knew is gone. The landscape is at ground zero. Could anything good come out of this devastation?